Children can pick up on their parents’ attitudes. Make sure that you and your spouse are always upbeat and happy when planning a trip to the dentist. If a parent is afraid, the children will also be afraid. Be sure to act excited for the visit, and tell your children how important dentists are. Most family dentists give children stickers or small toys after a visit, but you can plan your own rewards as well. Schedule a fun outing right after your dental examination so that children will see the dentist as a prelude to some fun. Focus on activities, like going to the zoo, instead of food or other treats. Remember that when children receive fluoride treatments, they must go half an hour without eating or drinking. Sometimes the waiting room is the hardest part of a visit to the dentist. Smaller children do not like to sit still and wait, and children who are already nervous will likely become more agitated with a long wait. Bring a set of favorite books and toys to keep children calm, distracted and happy before the appointment starts. Avoid candy and other treats, though, or your child may need more extensive cleaning. Not all dentists focus their practice on families and children. However, good family dentists are easy to find. Ask friends and neighbors, or check out social media sites where people leave reviews of businesses. 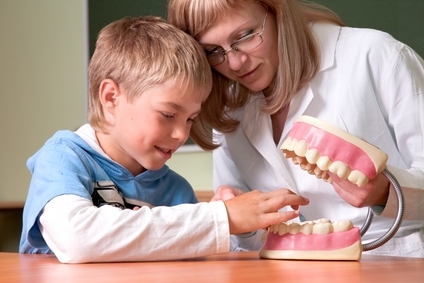 Look for a dentist who works with children and is noted as having a pleasant demeanor. A dentist who specializes with families and children is also more likely to have an office and staff who are more welcoming and friendly to children. Family dentists may also be more able to accommodate appointments for the whole family on the same day so that you won’t have to make multiple trips. A trip to the dentist can be painless, but only if a child has taken good care of their teeth. Teach your children to brush and floss daily, and make sure that they know the proper techniques. Healthy teeth and gums will be less sensitive and less likely to bleed at a dental checkup, which will help make children more comfortable with the trip. A child with clean teeth will also receive praise from their family dentist, something they can be proud of.